blue ivy carter – she’s just like wine! The kid with the most potential talent for music ever has finnaly arrived! Jay-Z and Beyoncé’s collaboration, Blue Ivy Carter, has popped out. No word yet on if they played their tunes during delivery à la Mariah, but we’re sure Baby Blue will be dancing and rapping in no time. It’s pretty amazing when two entities come together to create a third, but this happens all the time with grapes. Tons of grapes you know and love and drink are the offspring of two kinds of grapes. For instance, Syrah and Peloursin got it on and created Petite Sirah. Peloursin wine is heavy, tannic and has a bit of spice, some red and black currant taste – it’s rarely seen on its own now as most people think it makes lame wine (though you can’t say the same about Beyoncé!). Syrah gives its little baby some funky, leathery, tobacco characteristics – so Jay. And voilà! You get the inky, bold and overall awesome Petite Sirah! Also, did you read how “bottles of red wine were being delivered to the hospital’s private wing” on Saturday night? Ohhhh yeah, grapefriend in the making. So welcome, little Petite Sirah Blue! With your DNA, we can’t wait to add you to our repertoire. 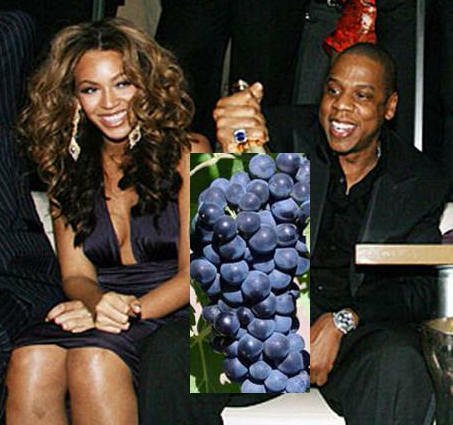 Tags: blue ivy carter jay-z beyonce wine petite sirah durif peloursin syrah. Bookmark the permalink. Welcome to the world, Blue!!!!! Congrats to Beyonce and Jay!! She is just going to be absolutely beautiful and the name Blue will become more popular. congratulation to Beyonce’ and Jay-Z, also to the new Grandparents.